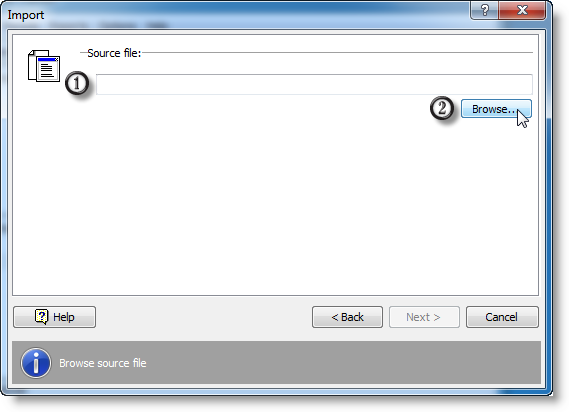 Choose the imported file and move to the next step by clicking the Next button. 1. Several first lines of the imported file. 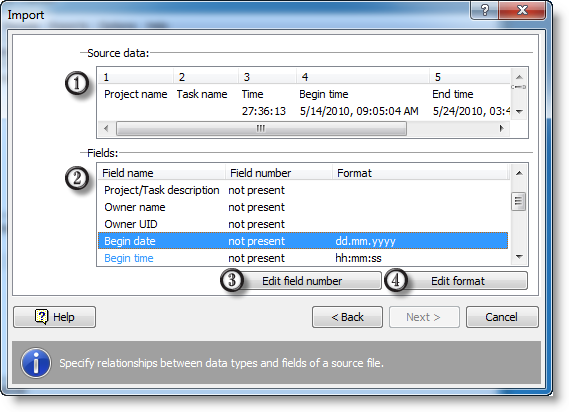 A CSV file consists of several lines containing data separated by "," or ";". You have to define which field means what. Choose field number containing unique identifiers of projects and tasks. A unique identifier should be 32-bit integer. Choose field number containing period and task descriptions. Choose field number containing parent task (to retain hierarchy). Choose field number containing UID of parent task (to retain hierarchy of projects and tasks). Specifying Owner name or Owner UID is enough. Choose field number containing period start date. A field with start time should be defined. Choose field number containing period start time (no date). Choose field number containing period start date and time. Begin date and Begin time fields should not be defined. Choose field number containing period end date. A field with end time should be defined. Choose field number containing period end time (no date). Choose field number containing period end date and time. End date and End time fields should not be defined. Choose field number containing period duration. Fields describing period end time should not me defined. Choose field number containing period description. Data will be inserted to the current (selected) task. All information and error messages will be displayed in this window. 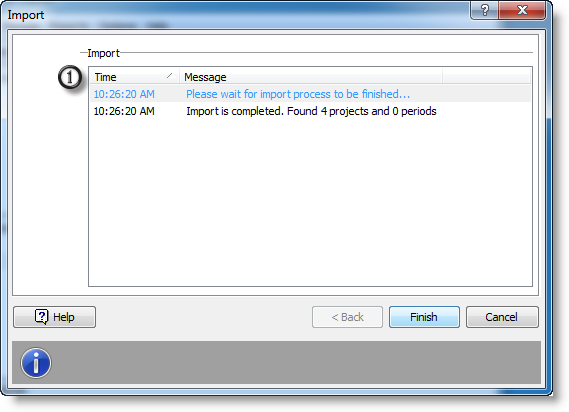 Click Finish to confirm data import.